Today we are looking at January's Pen Parcel, aka the Birmingham Pen ink subscription. Every month five new, 5ml samples hit my mailbox. Sometimes the inks become available as singles on the Birmingham website about a month after the subscription, sometimes they are just test colors. These five are already available at Birmingham Pens. These colors are very bright and cheerful. I think it’s interesting that the Birmingham Inks have been made in a few different countries, this month they were made in Germany. Left to right, Herbert Simon Cranberry Nobel, Albert Einstein Relative Cadmium, Rodman Gun Gunpowder Tea, Bob Prince Green Weenie, and Winter Garden Snowflake. Four dried in 30 seconds, and Cranberry Noel dried in 70 seconds. Feathering: Low-there was feathering on Rhodia and Leuchtturm, mainly in the flex nib. Bleeding: Low-just a little bit of bleeding on Tomoe River paper. Other properties: low shading, no sheen, and no shimmer. Each of the five had just a little bit of shading. On Staples 24 lb copy paper there was lots of feathering in every nib size as well as quite a bit of bleeding, so I would not recommend these inks for cheap paper. Cranberry Nobel is closest to Bungubox Mother Pink. Relative Cadmium is closest to Sailor Jentle Apricot. Gunpowder Tea is a yellow-green, the closest I had was Colorverse Adobe which is a yellow, but it seems I don’t have any other greens in this color family. Green Weenie is closest to Robert Oster Opal Green. Snowflake is closest to Colorverse Horizon. 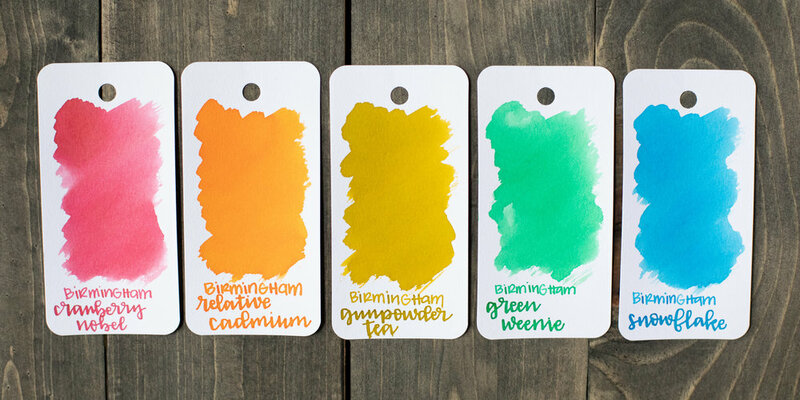 Click here to see the Birmingham inks together. I used a Bond A5 (Tomoe River 68gsm). Top to bottom, I used: TWSBI Eco Blossom Red with a medium nib, Pelikan M600 Vibrant Orange with a medium nib, Pelikan M400 White Tortoise with a medium nib, TWSBI Eco Transparent Green with a medium nib, and a TWSBI Eco Transparent Blue with a medium nib. 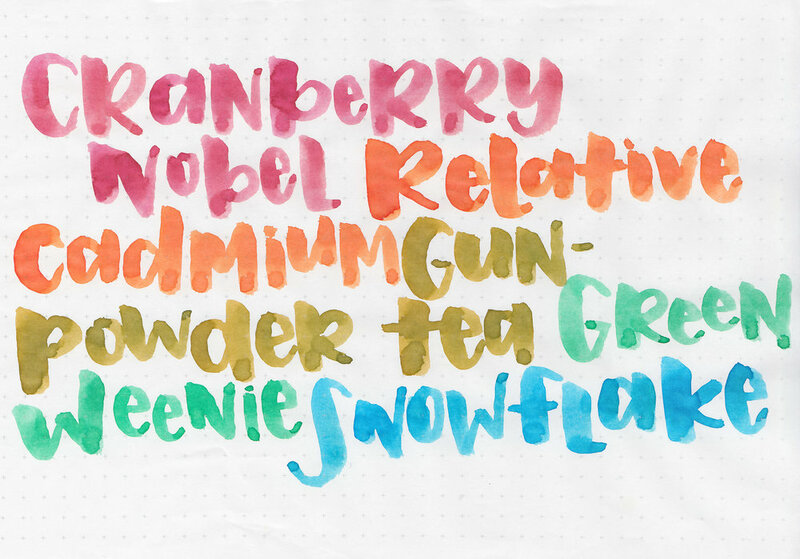 All of the inks had an average flow, but the consistency was a bit thin. I was talking to one of my kids while I was writing, I gestured to something, and ink came flying out of the pen all over the desk. I also had some issues with Relative Cadmium pouring onto the page while I was trying to write (you can see this in the Tomoe River writing sample shown above). Overall, I enjoy the bright colors, but the ink felt a bit thin to me and had some flow issues. I love that Birmingham is branching out and trying some brighter colors.